“noiseLAB Batch” for analysis of large batches of Recordings or edited Clips. 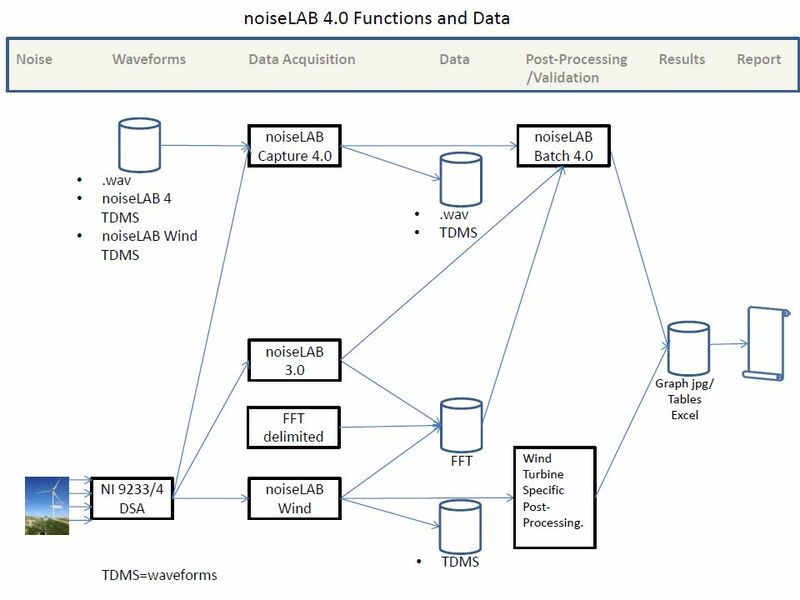 noiseLAB uses open data formats and can interface to a wide range of data types. National Instruments DSA Digitizers with IEPE transducer powering. This gives you plug-and-play configuration and a fully documented signal path. .wav files from hard disk recorders, sound level meters, and other sources. TDMS waveform files recorded by noiseLAB itself, or noiseLAB Wind. This gives you flexibility in analyzing files from other noiseLAB projects or noiseLAB Wind Recordings. TMDS waveform format, with complete metadata annotation. These files can be read by LabVIEW, Excel Plugins and others packages. The format is fully documented by National Instruments. .wav files. Recordings or Clips from noiseLAB Capture can be output in scaled format to optimize dynamic range of the resulting files. The relative level of the individual files is retained. Tables of Results for each analysis type in delimited format easily parsed by Excel or other applictions. jpg graphs of the result(s). For Time Slice analysis, graphs of multiple slices are automatically output in one operation. This flexibility means noiseLAB makes it possible for you to interface to virtually any source of signals and output data in a range of popular and open formats.